Beauty and the Gamer: May's Love It or Leave It! This month will be another Love It! I know, I'm pretty shocked myself, but I think that I've been on a roll when it comes to purchasing things lately! This month's focus will be hot tools. For my birthday, a couple of months ago, I had decided to stop using my drugstore hot tools. They just weren't cutting it for me anymore. Not to say that they were cheap (I mean, they still did cost about $40-$60), but I was replacing them quite often. So I decided that it might be time to invest in something a little more heavy duty and professional. And off I went! I do want to stress that these are mid-range professional tools - I'm not quite ready to make that big of an investment yet. First Love is my hairdryer. 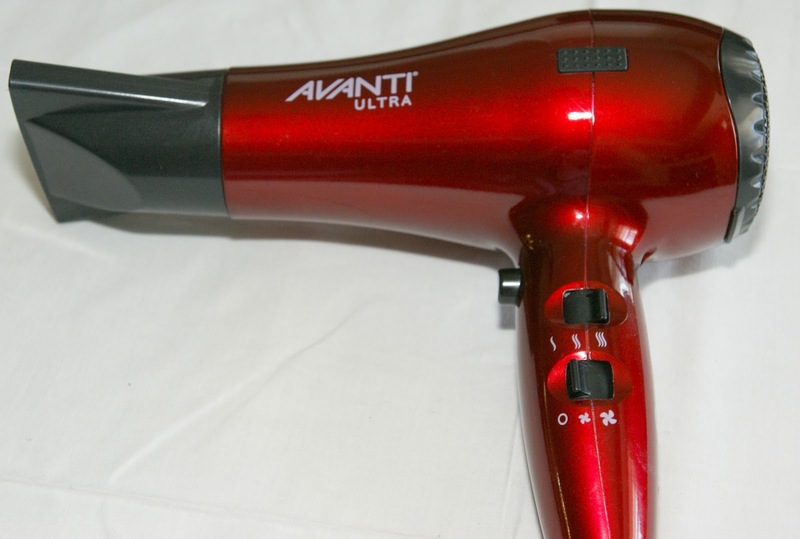 It's an Avanti Ultra Professional Hairdryer. My hair normally takes about 5 minutes plus to dry (that's a lot of time to be stressing out your hair with heat). Now, it takes less than that. And the best part of my hairdryer is the cold blast button. You press it once and it'll stay on cold blast until I press it again to turn it off. AWESOME! With all my other dryers, I had to hold down the button. This dryer had three heat settings (four if you count the cold blast) and three speed settings. It's got a removable magnetic filter cover, so I'm not breaking my dryer every time I'm trying to clean the lint! Second Love is my Flat Iron. I've been using one is a Vidal Sasson Ceramic flat iron that I purchased from London Drugs eons ago. Just lately, I've been noticing how long it's been taking me to straighten my hair. I would have to go over the same layers two three times to get it straight. Once again, Avanti showed me the way. The flat iron that I've been using the past couple of weeks is the Avanti Ultra Ceramic flat iron. There is a button that keeps your flat iron closed, but it doesn't close to the point the plates are touching each other, it leaves enough space to fit a finger. This way, it won't ruin your plates. I think that it takes me less time to straighten my hair than it does for the tool to heat up (which takes about a minute) and for me to spray the heat protectant on. It's absolutely wonderful (plus it's hot pink to boot)! Third Love is my Heroine Make Mascara Remover. This has got to be one of the weirder products that I've ever purchased. It's an oil based remover. No, correction. It's just oil. The applicator is like a weird mascara applicator. You put it on before you remove the rest of your make up, so by the end of everything, you just wipe with a kleenex and all mascara is gone! I think that it just completely dissolves the mascara. How safe is this product? Like with most other asian products, I'm not too sure, but I'm guessing that it's alright because on MUA it has some really good ratings. Another weird thing about this product is when you apply it, it doesn't move, so you'll never get it into your eye unless you rub it in there. If you have a heavy hand when it comes to applying mascara, you might have to leave it on for more than the normally required 30 seconds and you might have to wipe a few more times. I found that the best technique is to wipe with kleenex and then take your thumb and forefinger and rub your lash in between your fingers gently to get ANY excess off (for those more dramatic mascara days). There must be something in the air for me to have two LOVE IT months in a row! I can't complain though - there's nothing worse than knowing that you spent money on a dud product...so I'm happy that I found some gems! What are some of your love (or hate) products for this month...or ever? This mascara remover sounds interesting! Where can I get it? Those are great favourites.. reminds me that my hair dryer is like 8 years old and I should probably replace it! That makeup remover looks so interesting I have never seen a product like that before! It's a pretty crazy remover. I was a little freaked out when I first got it (i had to youtube on how to use it!). But it's fantastic. Little to no rubbing and fast. The mascara remover is interesting. I always find it hard to remove my mascara. Have to wipe it over and over and still not completely removed. Totally agree with you with investing in good blow-dryers and hair straighteners. Not saying the drug store kinds are not good. But the professional ones are so much better. Yes, they are pricier but last a lot longer. I got mine at Trade Secrets on sale. I hate wiping and rubbing my eyes until they are raw just to find out that I only got half of the mascara off! This stuff is simply amazing, Easy, no fuss swipe on and wipe off!